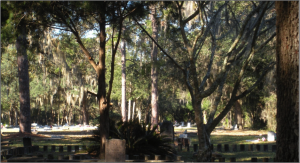 Evergreen Cemetery enjoys a location adjacent to three neighboring cemeteries or burial grounds. Evergreen Cemetery itself was segregated until November 1965. As a result, for decades African-Americans were buried in numerous other locations like small church yards. At the beginning of the 20th century and because of segregation, Pine Grove Cemetery became the local African-American community’s principal cemetery. Pine Grove is also the largest African-American cemetery in the county. The other two neighbors appear, at first glance, to be part of Evergreen Cemetery but are in fact separate. These are the State of Florida’s burial ground for residents of the Sunland Training Center, now known as Tacachale, and the Alachua County section for the economically disadvantaged.